We have a new challenge at Time Out Challenges. It is our 'Home Sweet Home' photo challenge. I simply went with the colour scheme picking out the gold and pink. This card went to fellow DT member and my very dear cousin Lynn who I am sure you will all agree deserves to be called our Queen of crafting. Her CAS designs have inspired me for years. Our Guest Designer for this challenge is the super talented and creative Hazel. I have followed Hazel for a very long time now. I am also in a 'virtual' crafting club with her so we have become closer over the last year and have a lot of fun crafting together. 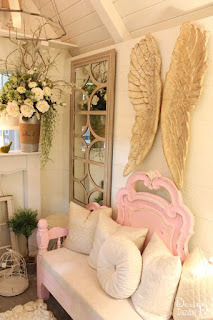 Check out her amazing blog Hazel's Paper Designs and you will see what I mean. We are so pleased she is joining us for this challenge. Pop on over to Time Out to see what Hazel and our DT have made to inspire you to join us. Next week the rest of the team will have more inspiration for you. I thought for a minute I'd got a sneak preview of my own birthday card. Just joking! Lucky Lynn - it's lovely. Sandie, thank you so much for your kind words! I am really grateful to have the opportunity to guest with you this month, as well as having the opportunity to get to know YOU better too! How lovely to be able to share this CAS beauty with your cousin! I love how you picked up the gold and pink. Such a gorgeous colour combo. Looking forward to seeing how everyone interprets this month's cue! So sweet....what an amazing card! Utterly adorable, Sandie. Hope you are feeling better, friend. I'm sure Lynn loved this! The layout is great and I love the added gold layer behind the die cut -nice touch! 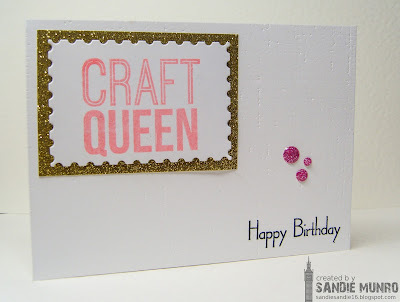 Very beautiful CAS card Sandie ! Love the pink and gold together ! I'm sure Lynn will love your card too ! Thanks for sharing. What a super card for a fellow crafter, cousin or not. I'm sure that Lynn loved the card - she is definitely a Crafting Queen!